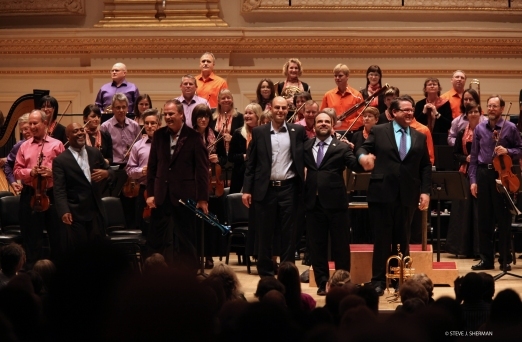 William Eddins, Jens Lindemann, Robert Rival, John Estacio & Allan Gilliland with the Edmonton Symphony Orchestra at Carnegie Hall, May 8, 2012. Photo © Steve J. Sherman. 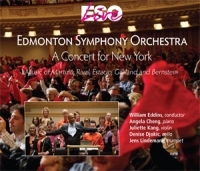 Featured on the ESO's 2-CD "A Concert for New York" (2013) alongside works by Estacio, Gilliland, Martinu & Bernstein. 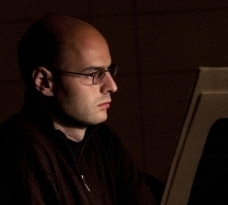 2014 Western Canadian Music Awards nominee for Classical Recording of the Year. Purchase. Video produced by Glenn Kubish of ATB Financial. Feature article [PDF] by Elizabeth Withey. I sketched this piece in the weeks following the birth of my son. As a first-time father it was a period of emotional extremes. I found myself elated and proud one moment, frightened and defeated the next. Nothing prepares you for the responsibility of caring for fragile, new life. Needless to say I spent a great deal of time attempting to comfort my son by cradling him in my arms, gently rocking him as I wandered around the house. My mind wandered, too, and I began to experiment with the metre of my rocking. I soon discovered that regularity in metre (staying in two or three, for instance) mattered less than regularity in pulse. So instead of a consistent 1-2-3, 1-2-3, 1-2-3 etc. I could rock in constantly changing metres, such as 1-2, 1-2-3, 1-2, 1, 1-2 and so on, each "1" receiving a slight downbeat stress. It is precisely with this rhythm that the piece opens (in the double basses). But it never repeats, the calming, steady pulse combining with metric unpredictability to create a floating sensation. The first five notes simultaneously introduce the lullaby's basic melodic idea, D-A-F-E-G, a cipher derived from my son's name, Raphaël. While Brahms's legacy lives on in all crib mobiles, many lullabies�the more stylized, less soporific�are, as one observer aptly put it, "certainly not intended to lull a child to sleep but to remind each adult listener of his own childhood". The abundant ornamentation in Chopin's Berceuse, Op. 57 and the prickly dissonances in Ravel's Berceuse sur le nom de Gabriel Fauré, to take just two examples, are more rousing than pacifying. If these lullabies recall our childhoods, then perhaps mine brings solace to the anxious parent. —R.R. 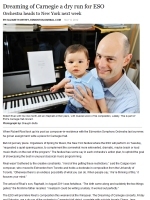 2012—multiple broadcasts on NPR-affiliated radio stations across the U.S.
"Robert Rival�s tender, slightly Ravelian Lullaby (2012) uses changing metres, rather than the triple time of cradle-rocking, to evoke walking and rocking his first child."